In October, Venom will launch Sony’s Spider-villains universe. 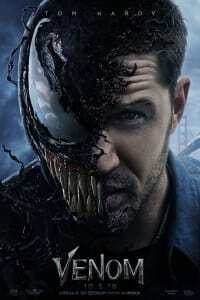 Tom Hardy stars as journalist Eddie Brock, who is exposed to an alien entity, and is forever transformed. 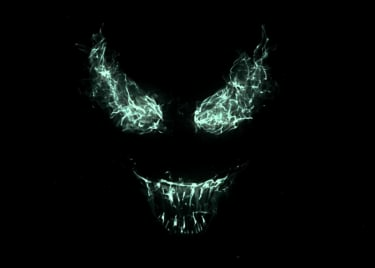 While some fans aren’t sure how the film can work without Spider-Man, the first Venom trailer has been viewed more times on YouTube than any other trailer to date. The latest trailer for the film, which may be the final one, is essentially a shortened version of the footage shown in Hall H at San Diego Comic Con, and a lot of the scenes will be familiar from the first trailer. The bonus is: now they’ve got better CGI, which proves the film is still taking shape. Here are some of the key takeaways from the latest Venom trailer. Tom Hardy’s Eddie Brock is an investigative journalist, and the film kicks off with his attempt to uncover the truth about the secretive Life Foundation. Rumors say the foundation is performing illegal experiments on vulnerable test subjects. Eddie even manages to confront CEO Carlton Drake about those stories, and is thrown out on his ear. Eddie’s investigation takes a sinister turn when he breaks into the Life Foundation after dark, and encounters one of these “test subjects.” Though he doesn’t know it, Eddie has just come face to face with a symbiote. We’ve long heard that multiple symbiotes would appear in Venom, and now that’s confirmed. The trailer revisits the crashed spaceship which brought the symbiotes to Earth. The symbiotes are indeed an alien life form, just as in the comics. Moments later, there’s a glimpse of multiple canisters, each containing a different symbiote. Footage later in the trailer suggests one symbiote was released during the crash, and went on a murder-spree before being captured by Drake’s agents and taken for study. That symbiote, confirmed as Shriek on IMDb, is the one Eddie encounters. The trailer shows her leaping at him, and presumably she infects him with a symbiote of his own. The trailer confirms that Riz Ahmed’s Carlton Drake is the main villain, and for the first time it gives the character a chance to explain his motivations. Drake believes that the human race is doomed, too weak to survive a coming environmental catastrophe. Everything he does is, in his mind, justified by a desperate desire to accelerate evolution in order to ensure humanity survives. Drake views the symbiotes as the key; they offer an opportunity to blend humanity with a stronger, more powerful and enduring race. Over in the comics, Venom has always referred to itself as “we.” It looks as though the film will take that one step further, giving the symbiote an actual agenda. In one chilling scene, Eddie demands that the symbiote explain what it wants from him. “You’ll find out,” the creature responds, pinning him to a wall as though reminding Brock that he is at its mercy. The conflict between host and symbiote is one of the trailer’s key themes, and it seems the argument between Brock and the Venom symbiote becomes more visual as the story progresses. 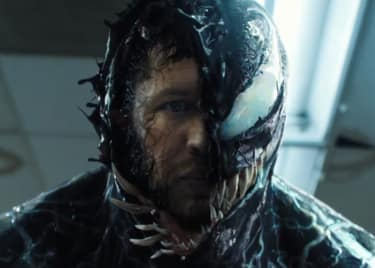 At first Brock is hearing voices in his head; later on in the trailer, though, the symbiote is manifesting a separate Venom head from his arm with which to argue back! Sony finally revealed Venom‘s main villain at Comic Con. That’s Riot, a monstrous symbiote introduced in the classic Venom: Lethal Protector miniseries. Where other symbiotes bond to a specific host, Riot seems to jump from person to person. That makes it impossible to track, and equally difficult to predict. It seems like Riot will take possession of Carlton Drake himself, and possibly launch a murderous rampage at the Life Foundation. There’s a tradition in superhero films for the heroes to take on bad guys who are essentially inverted versions of themselves. It allows the movie to truly explore what makes the (anti)hero tick, and to discuss the fine line between heroism and villainy.